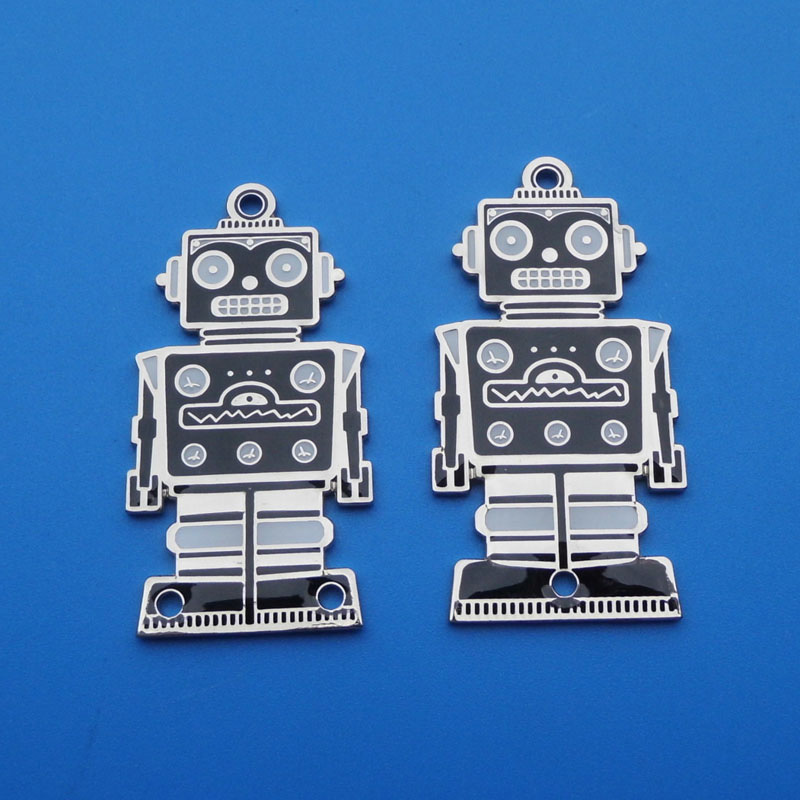 Just received this photo from the factory of our new “Mechman”, robot themed truss rod covers for Gibson, Epiphone guitars and many others. 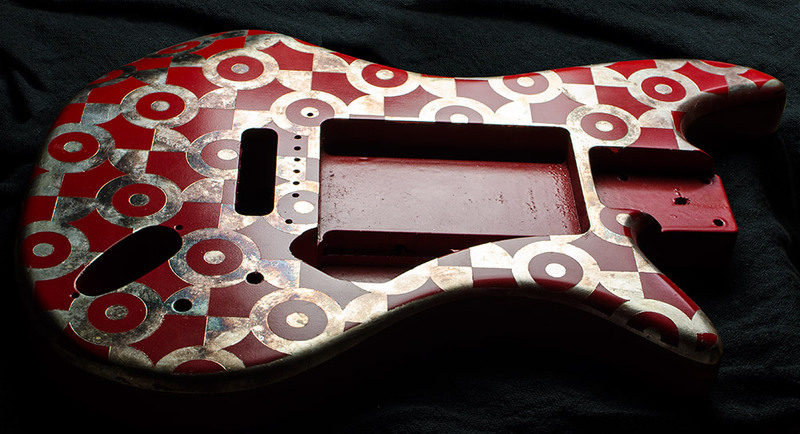 Before going into production on these I installed a mock-up version on one of my guitars and I must say that they look very cool indeed. Look for them in our accessory shop very soon! 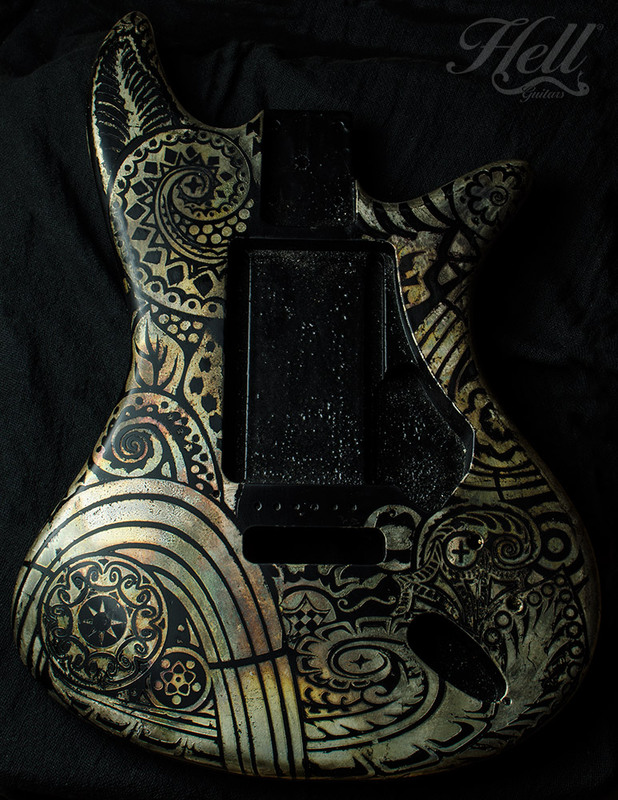 Tele Spadeburst 1 (varation) pickguard. Well actually, I have been around but just have not up to my blogging chair for awhile. Beyond the usual taking care of customers (who always, deservedly, come first!) I’ve been riding a nice creative wave. Lots of new products designed, some are in production and some of these available within about a week. 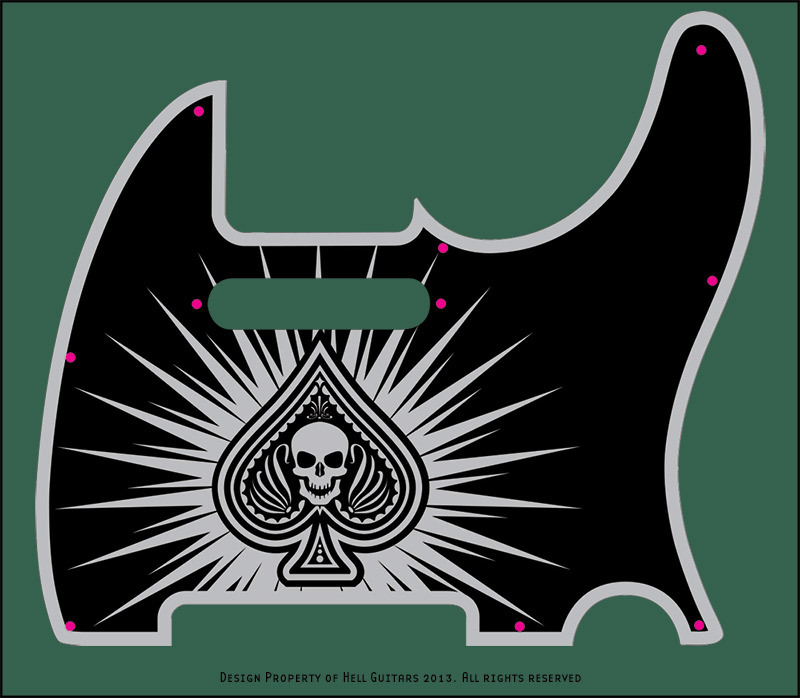 Above is a design (and a variation), of a new pure silver leaf/plastic pickguard. 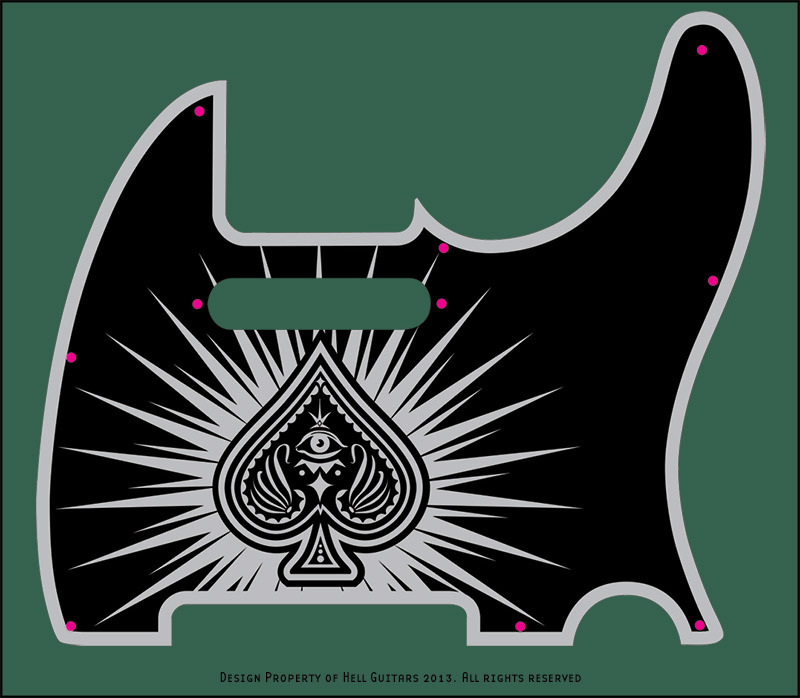 I always rather liked some of the badass spade designs I’ve seen so I thought I’d try one (or two) myself. The skull has been re-purposed from my trussrod cover design but works nicely here I think. The eyeball was actually my first design but when I dropped the skull in it just made a stronger statement. I do like the eyeball though as well so I’ll start out hand-leafing one of each. I’ll try to post photos of the final guards when finished and perhaps a work in progress. HellWires and the Tygers of Pan Tang Rock! 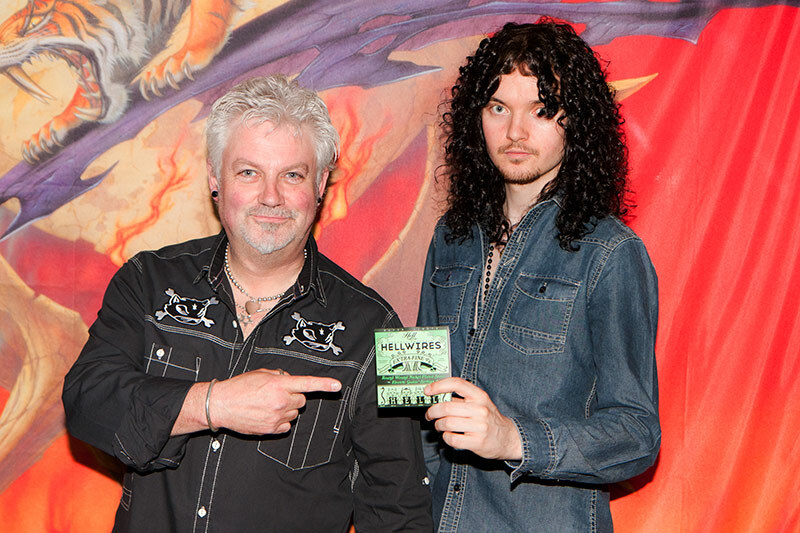 Tygers of Pan Tang founder/guitarist Robb Weir and guitarist Micky Crystal pose with a pack of HellWires- Their new strings of choice! Ambush. 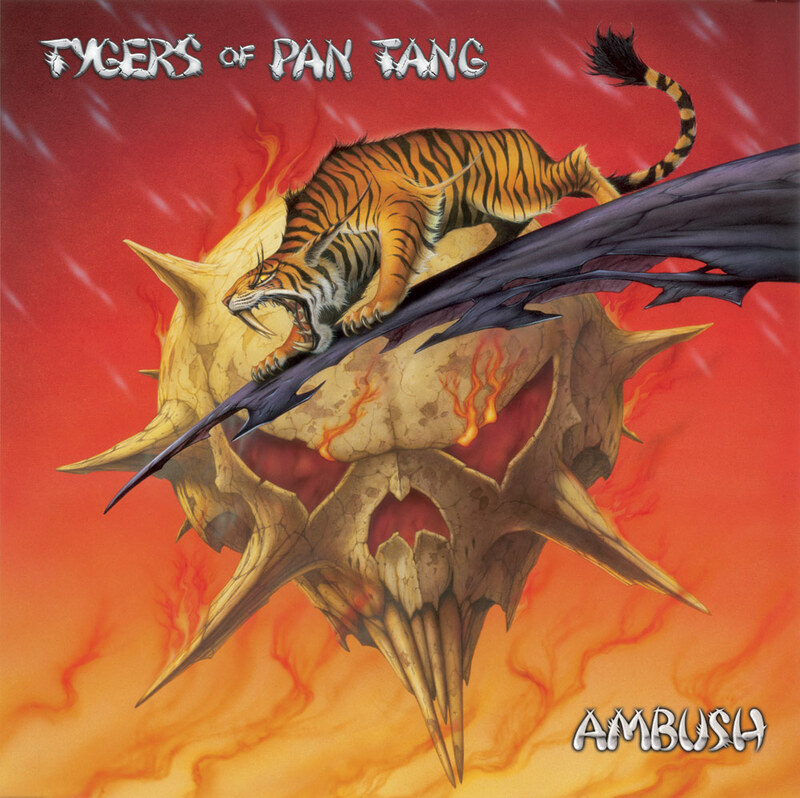 The latest from Tygers of Pan Tang. 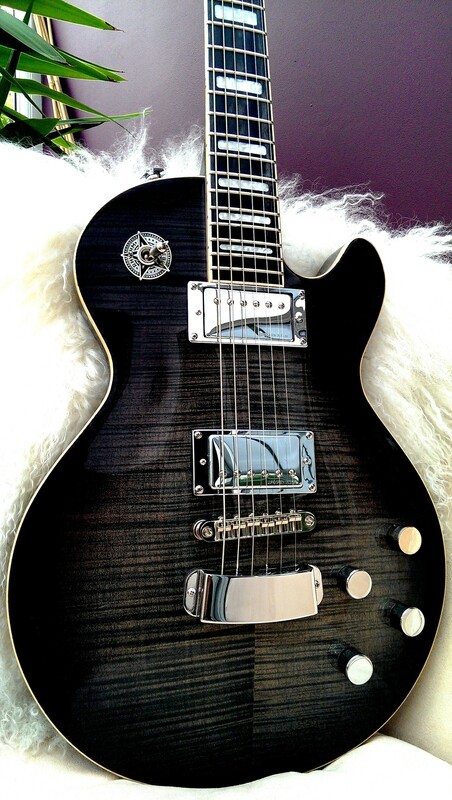 Our friend CJ recently posted this picture of his new Hagstrom (looks to be a Super Swede?) on his Facebook page. 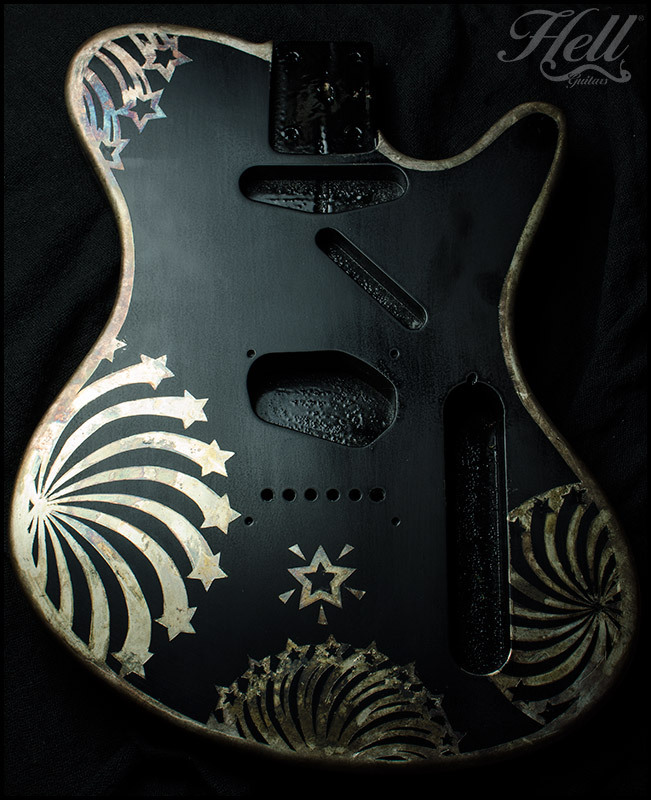 It is beautifully pimped out with nice chrome pickup rings and a nicely matching “Star” switch washer (from Hell Guitars of course!). 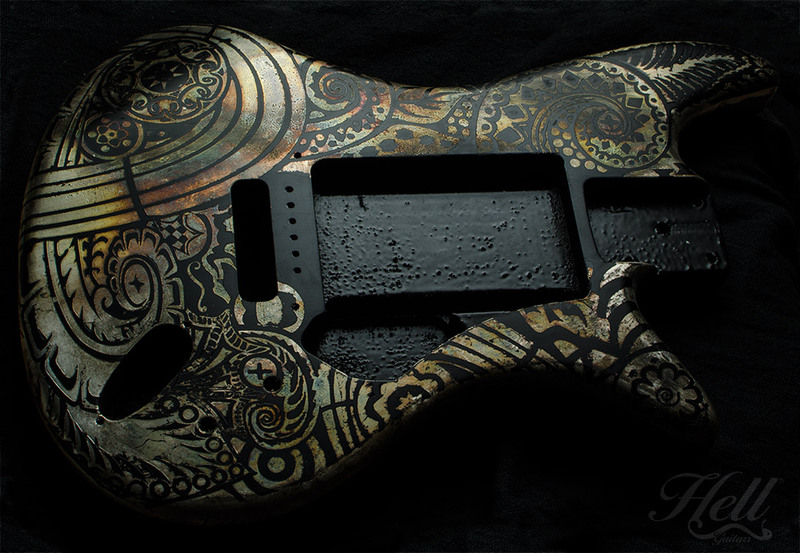 I must say, that washer really looks like it was made for this guitar. 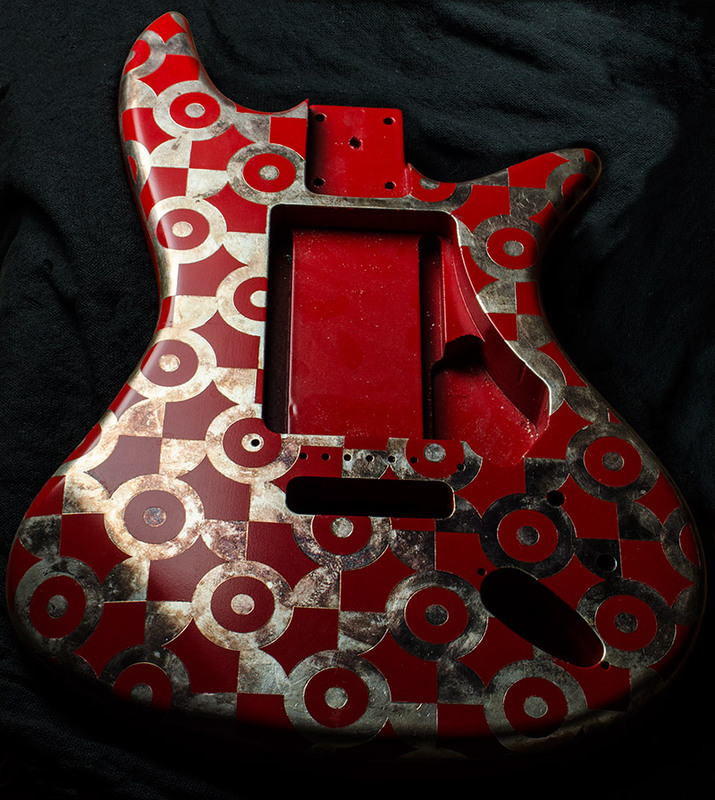 Or, perhaps to put it more self-importantly, that guitar was made for our washer…! 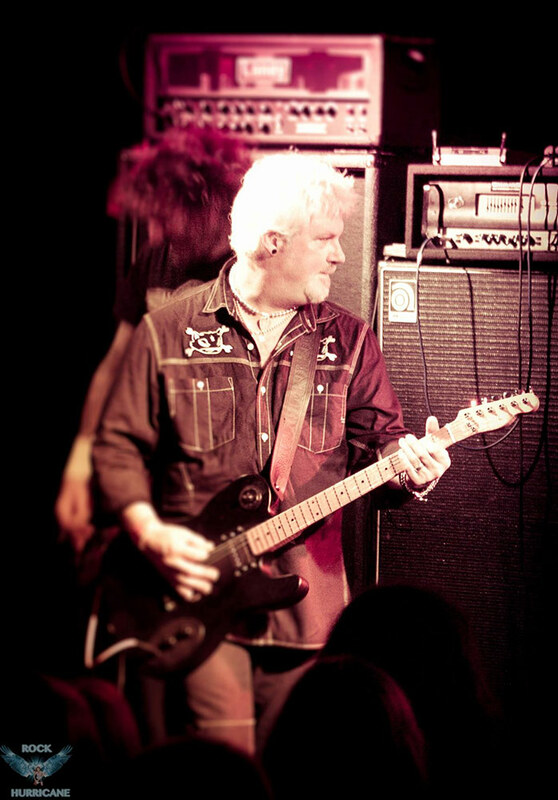 CJ should be well known to many of you as a singer/guitarist for a bunch of great bands like The Wildhearts, The Jellys, Honeycrack and CJ & The Satellites. If you’d like to visit his Facebook page you’ll find it here: https://www.facebook.com/CJWildheart Good man that CJ. Thanks for letting us use your pic! Here are some more naturally tarnishing silver-leafed custom bodies that are waiting for a few shots of clear poly before wiring and assemblage. I really wish that our days were twice as long so I’d have more time to do this kind of work as I really do enjoy the process. Perhaps with a maple fretboard…? And here’s a No. 2 in progress. Still a bit rough. Hello. My name is Michael and I am a plug-in addict. I thought I was in recovery however I recently had a relapse and purchased S-Gear from Scuffham Amps. Ordinarily, I would not allow this relapse to define me as a person and I would follow the Steps with the help of my Higher Power towards recovery. However this time I am truly glad I fell off the wagon because this plug-in is terrific! I will start out by saying that I own many of the guitar amp/effects packages (Guitar Rig 4, Amplitube 3, Eleven, Line 6 Farm are some that come to mind). I’ve used all of these for both play-at-home and recording and each has its very definite pros and cons. One con they all share however is that they just don’t sound or respond like playing through actual hardware. In general their processing fairly well covers (colors?) the quality of my pickups. I can approximate tones with these plug-ins however I cannot feel them. S-Gear is unique in this regard. The tone, the response are real. On the face of it, S-Gear is much more limited in terms of the amps and effects they offer (three amps and three effects- delay, chorus and reverb). Although there is no distortion rack, a mean (and natural!) distortion can be had with the amp drive switches. While it is true that S-Gear doesn’t have the wide range of effects found in the above-mentioned software it more than makes up for with its authenticity. I found more useable tones in S-Gear in 3 hours of playing than I did playing 3 years in the other packages. I think too, for me, I would spend more time playing around with the effects and their knobs trying to get what I wanted than I actually did playing. S-Gear is like plugging into a favorite old amp in pretty much any venue (the “Room” rack is superb). If you don’t find quite the tone you are looking for, a few up front tweaks will get you there. Mics include An SM57 and an M160. Another happy result of my relapse is the fact that S-Gear costs only $99. Amazing really for such a professional sound and user-friendly experience. My only gripe I suppose is the name. “S-Gear” sounds terribly uninspired. Not descriptive of anything and totally lacking in dynamics. The exact opposite of the plug-in itself. I suppose they could have hired a marketing team to get all clever but of course this would have added considerably to the cost. So S-Gear it is and as it is, it is pretty special! 4 and a half snakes! 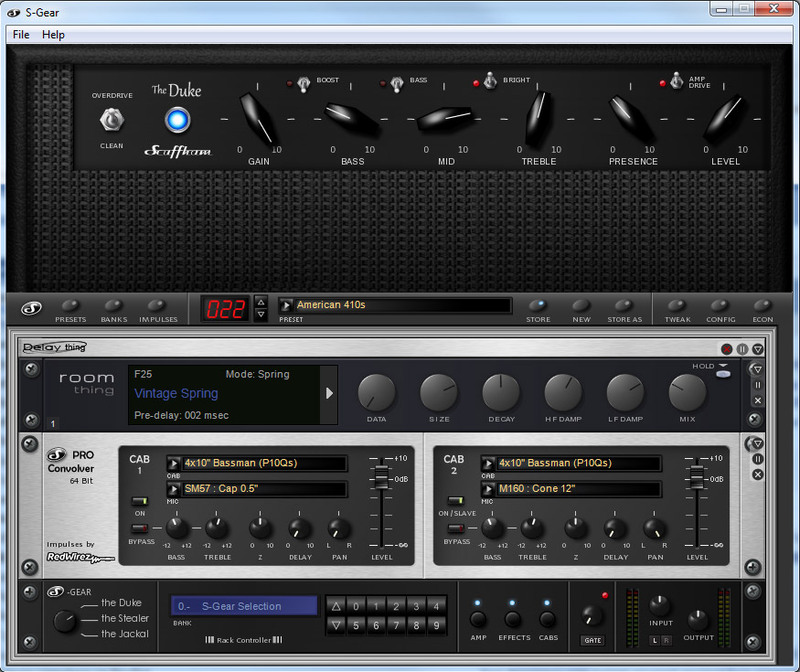 S-Gear comes as standalone and VST, AAX plug-in. In my case it plays nice with the latest version of Reaper. 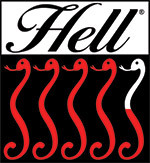 Hell Guitars is in no way affiliated with Scuffham Amps. We just like them… We give S-Gear an outstanding 4 and a half snakes! I recently (in fact, today..!) came across something special. A forgotten custom design I was creating for one of our ZeroDots was rediscovered during a rearrangement of my studio. It was, at the time, an interesting idea gone very bad. I had spent about 12 hours working on the design, cuttting/applying masks and laying the silver leaf. When it came time to remove the masking film lots of silver came off along with the mask, fairly well ruining the whole thing. I could have started over but I was so disgusted by my failure, I just cursed and threw it on a shelf. Actually before doing so I did take some sandpaper to it in an attempt to give it a weathered, industrial look but the result was crap, really. Fast forward to about 10 months later (in fact, today..!) and my rediscovery. In 10 months Nature had decided to take care of this ugly duckling which was (eventually) found piled behind another pile of unwanteds. 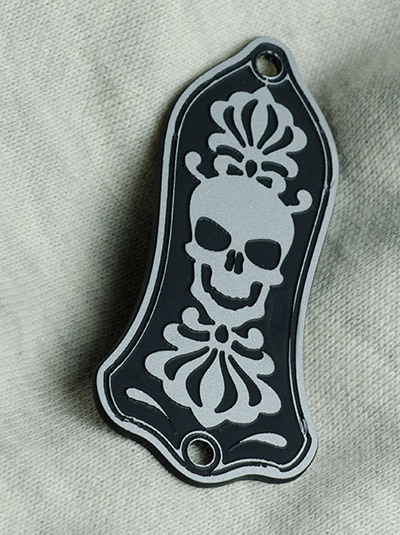 It kissed the silver with a beautiful patina that brought the design to life. Beautiful rust tones, merging into steel blues sliding into bright yellows. I absolutely love the happy result of my neglect. Couldn’t have done nearly as well myself! I am planning to finish it with similarly weathered hardware and maybe do a few rough passes with a chain or hammer to give it a nice industrial finish. If some of the motifs look familiar, I borrowed rather heavily from the Chanin Building, an Art Deco marvel, in New York City. Top view (click to enlarge). I actually did manage to cut the cover out on my machine the following day (see pic below) but didn’t get to laying the silver leaf and subsequent tarnish job until just the other day. It still needs a clear coat to arrest the tarnish but for the most part it is finished. Looks pretty good too, I think. 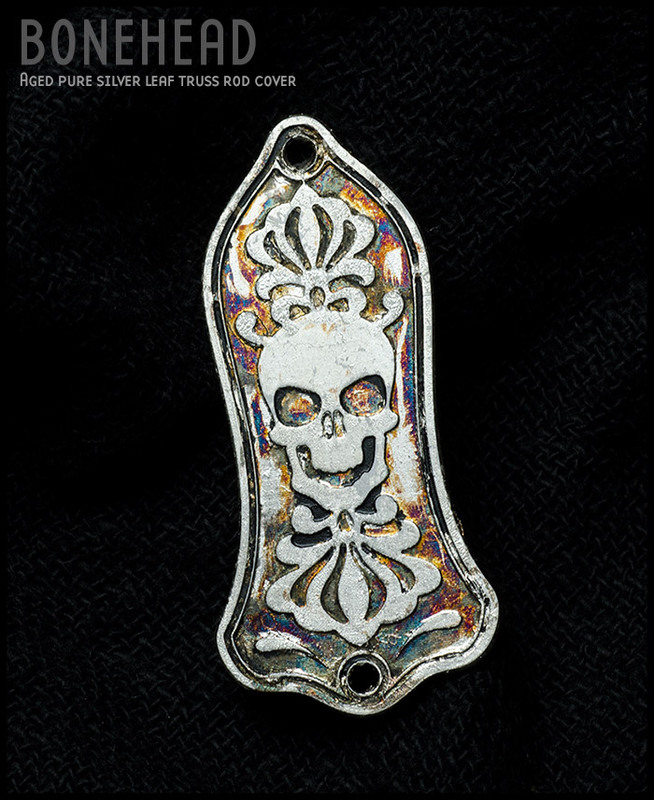 Looks like something one might find by digging up the lost treasure of some guitar loving pirates. Amazing what you can do with just a piece of plastic, silver leaf and some imagination (oh yes, and a computer, 3D software, CAM software, CNC machine…). Would love to hear what anyone out there thinks! 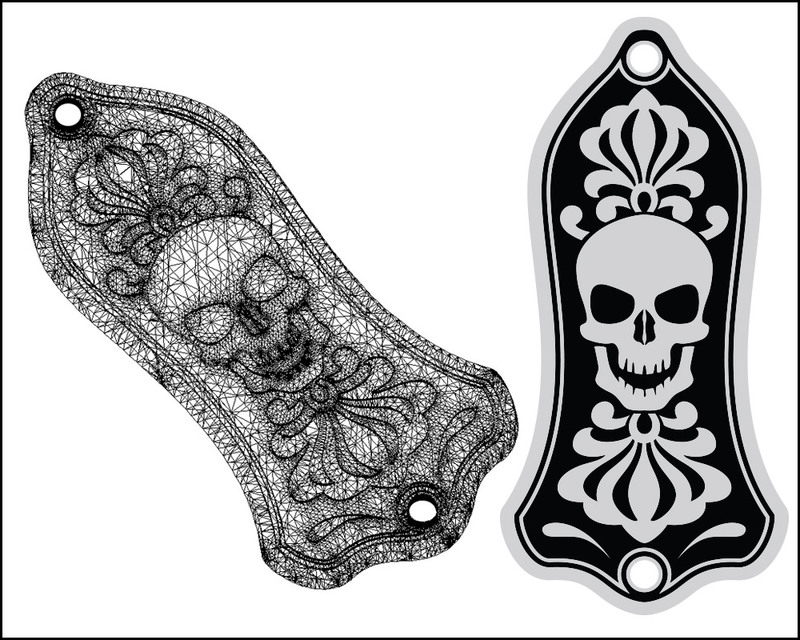 Here’s one of my latest truss rod cover designs. Along with the above, we have a similar 3-hole version as well. We also have two other new designs which all should be available in about 2 weeks. In the image, you can see a raster version of the original illustrator file on the right. I also created a 3D model in Rhino so I can output on my own CNC machine. I hope to create one tomorrow. I’ll post a photo of the finished piece as soon as I can. The final pieces will be cast in brass then enameled with a high gloss epoxy finish. I really love designing these pieces. It’s a lot of fun to play around with ideas and realize them quickly. Recently I was You Tubing around looking for Mick Ronson clips and came across this one from the Freddie Mercury tribute concert in the early 90’s. Mick was sadly very near the end of his life at this time but he was still out there, his greatness intact. Back to Ronson, he’ll have passed away 20 years ago later this month. Hard to believe however time passes for us all, I suppose. It’s a shame though he didn’t get a little more.